Do you have a “manfish” or “womanfish” in your family? And by that, I mean someone who from their earliest years, has been more comfortable in the water, than out? Then, this summer, here is a great read that is both informational and inspirational, as it relates the story of the boyhood beginnings of world-famous oceanographer, Jacques Cousteau, and how an early aquatic curiosity shaped a life-long passion that fueled not only a career, but a cause. In reading a story about a man who hid underwater by breathing through a long tube, young Jacques tries and fails to do the same. He finds it impossible. But, it sets him dreaming that someday…he, too, will be able to breathe under the sea. From that moment, comes a period of experimenting and writing illustrated books with his own drawings. He is drawn to machines, even building a crane as tall as he was – that worked. Movies were also a source of fascination, as well. He strove to know how films were made, the workings of cameras… even going so far as to save for one – then taking it apart and putting it back together. Finishing school, Jacques joins the French navy and sees the world. In China, he sees men catching fish underwater, with bare hands, holding their breath for long minutes. What would that feel like? Then, a friend gives him goggles and a rubber-framed mask….and the undersea portal opens as if a door to an undiscovered world comes to life. Kids will delight in Cousteau’s inventive spirit in creating a waterproof case for his camera. And did you know he invented the breathing tank apparatus called the aqualung, which, at last, gave him the ability to …swim, glide and dive unfettered, beneath the sea he so loved? He could even do flips and somersaults…underwater. But, how to explore the oceans of the world is the big question? Cousteau finds a “big, old wooden navy ship named “Calypso.” In a year, he morphs it from a war ship to an exploration vessel. Giant whales, sea turtles, plants that could feed you, and “plants that looked like fish and fish that looked like plants,” plus friendly porpoises, and less than friendly and frightening sharks, are all part of this undersea discovery world that Jacques Cousteau’s voyages aboard the Calypso, unveiled for the world to see. Jacques knew what he had to do. He had to make movies. Movies to warn people. Movies to save the sea. 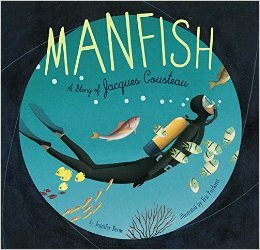 Jennifer Berne’s Manfish: A Story of Jacques Cousteau, makes his stunning, silent and sacred underwater world understandable to young readers. So, if you have a young reader that has an early and unrelenting curiosity towards knowledge of all things aquatic, then Jennifer Berne’s “Manfish; A Story of Jacques Cousteau” is a great place to begin to satisfy that inquiring mind this summer. Please enjoy singer/songwriter and environmentalist John Denver’s lilting and lovely homage to both Cousteau and the crew of the Calypso.